Yet that voyage of discovery takes time, especially when you–and here when I say “you” I mean “me”–are not the fastest writer in the world. How I long for the prolific rate of Stephen King, but that’s just not how my mind works. (Also, Stephen King doesn’t have a non-writing day job taking up his time.) And all that is my lead-in to saying that A Dragon at the Gate is not progressing as quickly as I’d like. Oh, it IS progressing at least. Don’t worry about that part. I’m moving steadily forward. I’ve killed off some people. (It’s remarkably liberating to suddenly realize that murder is among a particular character’s problem-solving tools.) But I’d hoped to have the a completed draft to send into the editing machine (a.k.a. Bethany Root of Booktrope) by September, and that’s just not going to happen. I’d hoped to have A Dragon at the Gate, the final book of my cyberpunk series The New Aeneid Cycle, ready for a December 2015 release, but that’s probably not going to happen either. Finalist in the Independent Author Network 2015 Book of the Year Awards! 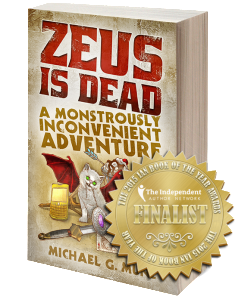 In other news, as indicated by the title of this entry, Zeus Is Dead will be getting a sequel. The book is getting a lot of attention lately, with new readers every day, so it just makes sense that I reward that attention with more. I’ve always wanted to return to that particular literary universe, of course. I’ve missed writing comedy. (Aside from A Dragon at the Gate, I’ve written an entire other–unpublished & stand-alone–novel, so it’s been a while since I’ve gotten to let my comedic side out to play in a book.) I also must admit that my longing to write comedy again is leading me to already do some planning for the sequel. This isn’t to say that I hadn’t already given it some thought, even as far back as when I was finishing writing it five years ago. I didn’t have specific, hardwired ideas for exactly what would happen, but I had a lot of possibilities. For example: In the the ZID world, it’s stated that Hecate is actually adopted. The question of “Adopted from where?” was something I’d intended to address. But I’ve recently had a bit of a brainstorm on another front: something fantastic (if I do say so myself), and something even foreshadowed–unintentionally–in ZID. It’s an exciting thought, and makes me all the more eager to write it, so I may be working on two books at once soon. We’ll see. And no, I won’t tell you just what that idea is. But you do get a hint: The foreshadowing I mentioned is from the press conference in Chapter Two. So that’s the state of my writing, at the moment. Use this information as you will, and remember: Keep watching the skies!!! …I don’t know why you should keep watching the skies. Flying squirrels, probably. Those fuzzy punks come out of NOWHERE. Zeus is Dead 2… I’m so excited!!!!!!!! !